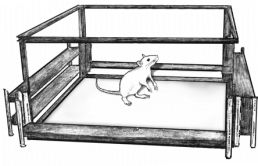 In the open field locomotor activity test, rodents are placed in an open box where total activity, discrete movements, distance traveled and rearing are measured. Measurements of various components of horizontal, vertical and stereotyped behavior are used to detect the effects of drugs, genetic manipulation, etc., on motor function. The test is sensitive to hippocampal and basal ganglia damage, as well as to hind limb dysfunction.